Great customer service. Cabinets arrived quickly and were very easy to assemble. 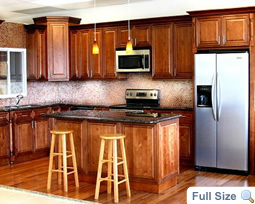 I could not find similar quality RTA Kitchen Cabinets at lower price anywhere else. I was skeptical about buying kitchen cabinets online but after speaking with Eugene and receiving cabinet samples I decided to buy Cream Maple rta cabinets from Craftsmen Network. I enjoyed the high end features that these cabinets offer. Total price was about 30% lower than big box store quotes. Free shipping made all the difference. Cabinets are great and assembly was easy. I can't wait when we finish our kitchen renovation. All wood & plywood material without particle board. Cabinets come ready to assemble. Drill, wood glue and staple gun are needed to complete assembly. Made from the choicest maple woods, the smooth and even pattern of grains make the glowing richness of the handsomely dark glaze stand out in the most sensational way that only Mocha Maple can emanate with. The advantage of inherent strength and aesthetics of hardwood is polished further by innovation in design and superiority in craftsmanship. The simple and timeless lines of symmetry, together with the enigmatic façade, that Mocha Maple brandishes makes up for an excellent addition to a wide range of designs. Mocha Maple is among our showcase of cabinet series that will delight you with their individuality—brandishing a durability that equals a unique beauty that is brought out by the natural appeal of wood, made more attractive by the exquisite blend of glaze and finish. 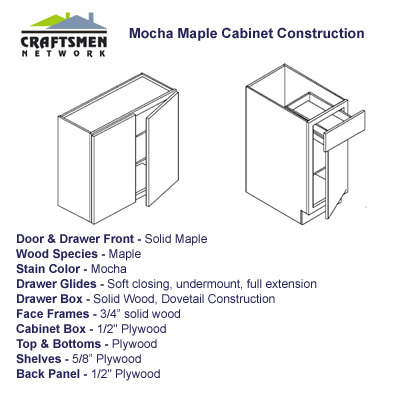 And just like every splendid line of Craftsmen Network's kitchen cabinets, Mocha Maple will prove to be a lavish concoction of efficient form and function. 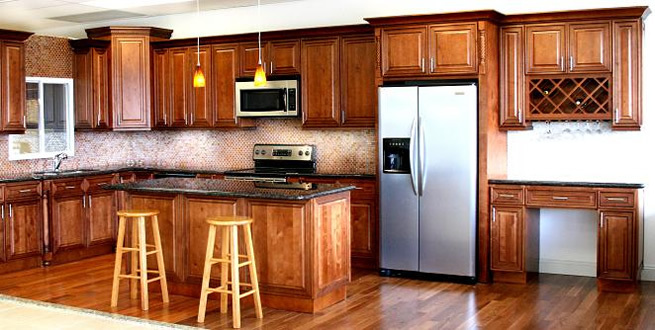 Craftsmen Network, your reliable source of quality cabinets, understands what makes products well worth your money. Other than gracing your homes with that exquisite welcoming warmth to last years and years of fruitful use, the price with which our Mocha Maple cabinets will prove too reasonably tempting to resist. And as if all these benefits do not make up for extravagance yet, Craftsmen Network stays true to another core value and that is customer service at its finest.